After Hurricane Florence dropped record-setting rainfall over parts of North and South Carolina, the aftermath of the deluge could be seen from space more than 22,000 miles above Earth. These two images, captured by the GOES East (GOES-16) satellite on August 31 and September 18, show how the landscape changed before and after Florence inundated the region. 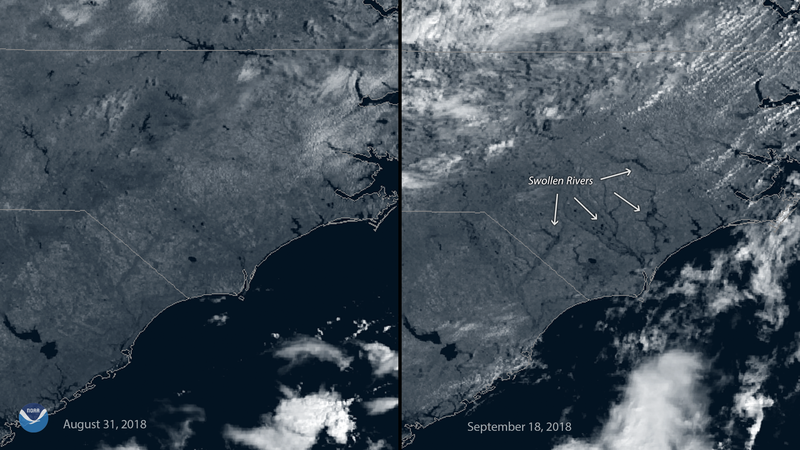 In the right hand image, several swollen rivers and tributaries appear in southeastern North Carolina, where widespread rainfall totals above 20 inches were recorded during the storm. In Elizabethtown, located along North Carolina's Cape Fear River, the National Weather Service (NWS) reported nearly three feet of rain (35.93 inches) fell from September 13 to 18. This total set a preliminary new rainfall record for the state of North Carolina, surpassing the previous record of 24.09 inches that fell during Hurricane Floyd in 1999. A post-storm analysis from the NWS Hydrometeorological Design Studies Center showed that over a wide area, three-day rainfall totals from Florence had a 0.1 percent chance of occurring in any given year, making Florence a 1,000-year rainfall event. The historic rains caused many river and stream gauges to peak at their highest levels on record, the U.S. Geological Survey said, submerging entire roads and damaging tens of thousands of homes. This GOES East imagery is from the satellite's near-infrared channel (Band 3) on the Advanced Baseline Imager, which is useful for monitoring land features such as fire damage and river flooding. High-resolution before-and-after aerial imagery of Hurricane Florence's flood impacts is also available from the National Geodetic Survey, a division of NOAA's Ocean Service.